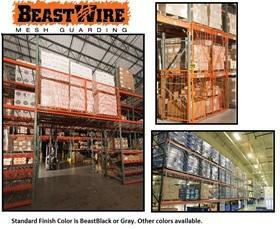 BeastWire Mesh rack guarding systems are the smart solution for your warehouse. Don't be misled to believe netting or other lower grade products are designed for safety. 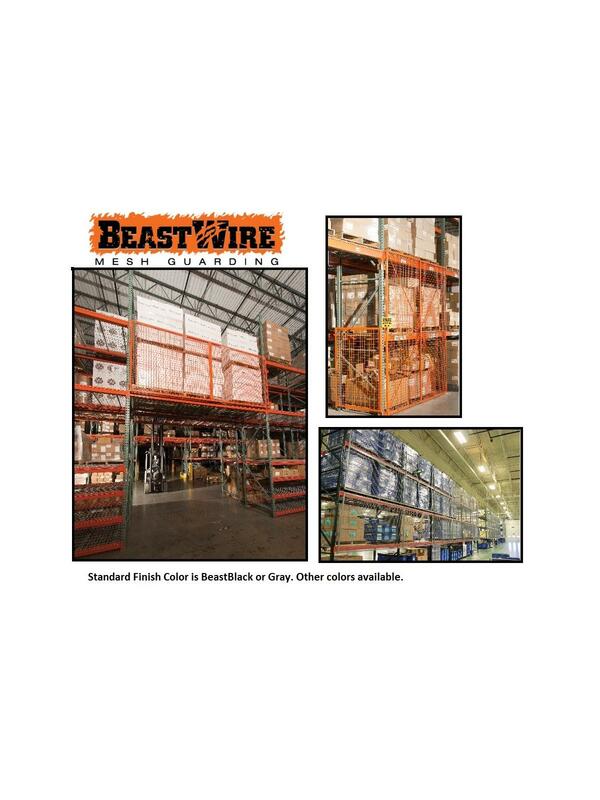 BeastWire is designed to stop loads from falling or shifting off your storage rack system. With a name like "Beast", it's only fitting that our material is built to last with a fully framed welded construction. FOB Shipping Point. Whether you are securing loads to prevent accidents or valuable inventory to prevent theft, BeastWire Mesh rack guarding systems are the smart solution to endure the abusive warehouse environment. Standard 10-gauge (and optional, heavy-duty 6-gauge) 2 x 2" resistance welded wire mesh. Mesh is welded into 1-1/4 x 1/8" thick angle frame for maximum rigidity and security. Panels are punched with slotted holes at 12" centers allowing for multiple connection points and flexible panel orientation. Backed by BeastWire's unrivaled 10-year limited manufacturer's warranty. All material will be finished in our standard BeastBlack powder coat, unless otherwise specified at time of order. Please note that colors other than BeastBlack and SpaceGuard Gray may be subject to increased pricing and lead times. Rack Safety Panels and Connections are available for Quick Ship. See Related Items tab for Beastwire Grrripper Bracket, Bi-Parting Hinge Doors and Pallet Rack Guarding - Connection Accessories.